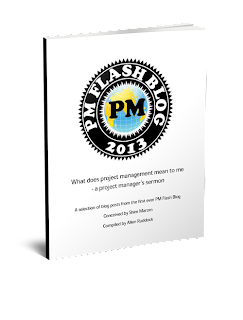 Musings on project management: That "trust" thing... again! Here's a point about trust that recently arose in my agile class. A student said traditional methods lack trusting relationships, whereas agile teams are more likely to embrace trust. Consider the theory of "Management Science", as developed in the early industrial age around 1915 by Fredrick Taylor. Taylor -- and his disciples -- held that all jobs could be described by a "job description" and that any qualified person could be plugged in -- so long as they were not "a square peg for a round hole" Thus: plug and play staffing. And, because these plugs were largely anonymous to management, bureaucracy was invented to contain and direct work, more or less anonymously, via protocols and policies -- No trust required! Just follow the rules, or perish. Along comes agile and replaces large scale bureaucracy with trust! What a concept! Now, admittedly, trust is hard to scale -- requires personal knowledge in the main. So, as scale increases, trust and bureaucracy trade places. The trend du jour is "flat" organizations and open space. Why? To get back to the virtues of a small scale -- trust and agility -- with a large organization. If everyone has to gather by a common water cooler, by and by people will get to know one another. Steve Jobs famously put the only rest room at Pixar in the Atrium... everyone had to go there by and by. Agilist Alistair Cochburn calls this communication by "osmosis"... absorption due to being the same place.